The food and service were excellent. The workers are friendly and you get big servings for little money at this restaurant! A place you, your friends, and family can hang out, have a good time and nice conversation. 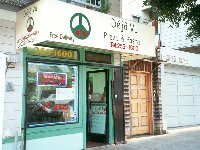 Deja Vu's menu is posted on the front window along with a welcoming, blue neon sign. The interior is cozy but hospitable.